There is a lesson to take from the reported demise of Pointless. Don’t rush a show into production. Chris Bath was original choice to host but ABC wouldn’t let her. Mark Humphries and Andrew Rockford had spent 20 mins together before taping first episode. … and know your freaking audience. Pointless was always going to be an odd fit for Ten no matter how good the hosts were. Far too cerebral for viewers who were accustomed to the brain numbing content (Feud/Simpsons etc.) they’ve had in that slot over the years. Yeah but I don’t think the hosts were the issue. And I actually really enjoyed the show. I thought it was great. But probably wasn’t a 10 show. 10 declining to comment . 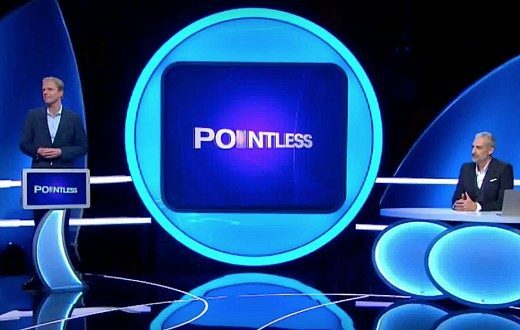 Speculation on the future of Pointless has media circles buzzing again. The article also makes note of its ratings consistently being under 200k which is not sustainable for the 6pm slot on a commercial primary channel. Well no, given WIN’s figures don’t contribute to the metro ratings. A few people have been asking me about reports re: @PointlessAU. 1. We are filming new episodes this Wed/Thur/Fri. Free tickets here: eventbrite.com.au/e/pointless-st… 2: If it is cancelled, I’m excited to see Ten following last year’s Gold Logie-winning strategy. Has Pointless been axed or not? I would say, internally they have made the decision to not renew it. Filming may continue to a certain date. But after that, it’ll be gone. Tonight's @PointlessAU is the first from the new batch of episodes we've been filming this year. If you haven't watched in a while, it's a huge improvement on our early eps. But I would say that, wouldn't I? 6pm, @Channel10AU. The end is near. Six weeks left. Celebrity Name Game will probably launch the same week as Masterchef. It’s not a bad show (like most of what 10 does! ), it just hasn’t been able to develop an audience on 10. Would be great if the ABC picked it up. If it wasn’t on at 6pm it may have worked. Pointless never had a chance just like Celebrity Name Game will never have a chance of success.